All transactions are safe and secure with a reliable history in online purchasing behind each of our associates. 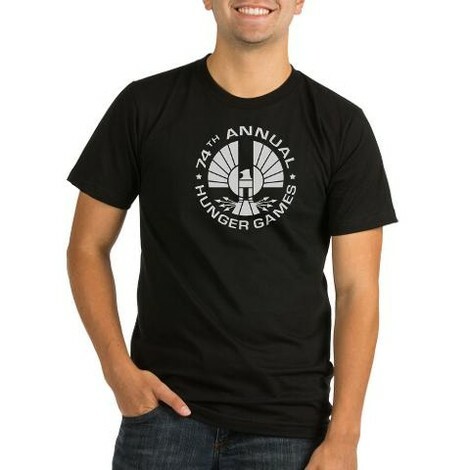 Buy the Hunger Games Logo t-shirt to own Hunger Games clothing and merchandise. In the center of this 74th Annual Hunger Games Logo shirt is the familiar Panem symbol, which is almost as recognizable as the symbol on the mockingjay pin, featured below. The pin was given to Katniss by the mayor's daughter Madge Undersee. It had originally belonged to Madge's aunt Maysilee, who was a tribute who lost her life in the 50th Games. The pin is a symbol of hope for the rebels and a sign to Katniss that Madge is her friend. The bird itself is an insult to the Capitol, since it is the unintended byproduct of their failed experiments with jabberjays. In addition to the Hunger Games Logo tee above, browse the Hunger Games Clothing Gallery for more apparel like men's and women's clothes, kids shirts or hoodies.